Learning English in Malta may seem, as we say in colloquial English, a ‘no-brainer’. Malta has all the ingredients for mixing a fun, leisure holiday with English language learning for all ages and levels. Malta and its sister island Gozo offer an established, cosmopolitan destination bang in the middle of the Mediterranean with plenty to see and do, from water sports to trips delving into the islands’ unique and fascinating culture and history. When it comes to choosing the right English language school though, the options seem more confusing. Malta and Gozo boast over 40 language schools, most of which at first glance seem to offer the same deal. So, we were curious to discover Maltalingua in St Julian’s; a language school that is not only a relative newcomer to the established ELT scene on the Islands but also one that has already gained a prestigious award for excellence in English language education – the internationally-recognised EAQUALS’ accreditation. Maltalingua management team: Michael Brewster, Director of Studies (L); Susanne Schalch, Director of Operations; & Mark Holland, Founder & Director. 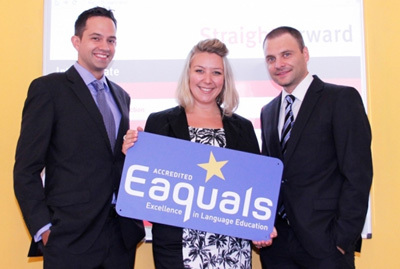 In brief, the EAQUALS’ label validates a school’s educational and pastoral standards and confers certain status in various countries’ education systems. EAQUALS’ schools are, for instance, recognised by CSN – the Swedish Board of Higher Education for the allocation of study abroad loans and grants. In Italy, the Progetto Lingue 2000 gives credit to EAQUALS’ courses as additions to school and higher education, while in Switzerland, a number of companies require EAQUALS’ certification for in-company language teaching. 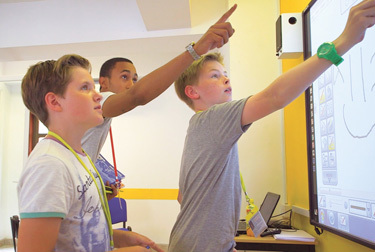 “We chose to invite the EAQUALS’ inspectors during our peak season, summer 2014, because we wanted them to see both our adult and junior programmes in action. We wanted to be confident we were being assessed thoroughly, and during our most pressured time of year,” Mark explains. Maltalingua was assessed across 12 different categories which measure standards at the school and of its services, covering a range of operations from English language courses and the welfare of students to the working conditions of employees and the standard of the school’s publicity information. Maltalingua was awarded the highest points of excellence in eight of the 12 categories. Although Maltalingua is a new kid on the block, its management team comprises ELT veterans who understand the stringent quality and standards required to attract language learners who are increasingly savvy online about checking out where to spend their Euros on educational courses. From the school’s video, we get a good idea of Maltalingua’s atmosphere; student feedback is invaluable in fleshing out the formal accreditation. “The key team has a wealth of experience and insight into the sector,” says Mark. “I am also the owner of Sprachdirekt, an international language school agency in Munich which represents over 40 international schools worldwide. Over the past 12 years, I have visited over 100 international schools which has given me invaluable insights into what I believe makes for a successful school. “I wanted to set up a school in Malta, the place of my birth, which encompassed the very best of the schools my agency represents and to maintain the high standards our clients have come to expect. I believe Maltalingua’s unique refurbished 400-year-old historical building with roof-top pool, garden terrace, café and an all-inclusive and lively social programme goes a long way to encourage a positive atmosphere in which our international students can feel welcome,” says Mark. Mark is supported by Michael Brewster, Director of Studies who has over 16 years’ experience working for schools in London, Japan, South Korea and now Malta.” Michael’s prior experience with EAQUALS’ accreditation for a prominent in central London was of immense value in guiding Maltalingua’s foundation and our ongoing development. His steady hand and leadership skills have developed an education programme of excellence and built up a team of highly-qualified and devoted teachers,” explains Mark. The third member of the core management team is Susanne Schalch, Director of Operations who joined the project from Sprachdirekt in Germany. “Susanne has proved a very popular and invaluable member of the team and is responsible for the successful provision of all non-academic aspects of the school. In a nutshell, Susanne is glue that holds it all together,” Mark notes. While there may be well over 40 English language schools on the Maltese Islands, it’s clear that the successful ones need strong, enlightened and experienced management like Maltalingua’s. The ELT industry is not one to get into lightly, and certainly not in the online age where the customer’s voice will most definitely be heard by all, EAQUALS’ assessors included. Adult English language courses, click here. Junior English language courses, click here. See also what junior students say about Maltalingua courses. Interesting article – thanks for pointing this out, I will check out this school. So whish to come to Malta soon! Lovely school – I’ve been there myself and it was a perfect stay 🙂 Congratulations! Thanks for the information. With so many differing schools in Malta its good to see an outside perspective written in such detail. My niece will be in Malta next month and Maltalingua looks like the one to go for. So far the school have been very engaging and helpful. I will post back with further feedback.